ClearFox® nature – The domestic wastewater treatment plant for up to 16 people – without power requirement! ClearFox® nature is a small sewage treatment plant a home sewage system pre-assembled at the factory and tested according to the European standard 12566-3. The connection size ranges from 1 to 16 residents. The water from the outlet can seep away, be directed into an outlet channel or be recycled into the raw water treatment. In case of sufficient incline, the domestic wastewater treatment plant can operate without power, i.e. without power connection. The home sewage treatment plant works as a biofilm plant with filtration effect – therefore, the biofilter material never needs to be replaced! This tecnology you will not find by any other domestic wastewater treatment. There are many forms of domestic wastewater treatment systems available today. Traditional domestic sewage treatment was in the form of a septic tank. A septic tank is a passive method of treatment with a limited treatment efficiency. A septic tank is basically a settlement tank, with solids being removed. There is limited biological treatment in a septictank. Many septic tanks fail and cause ponding when poorly constructed soakaways after septic tanks block. Also, many septic tanks were poorly constructed and are not water tight. Sewage needs a certain amount of time in a septic tank for the solids to settle out. Extra groundwater or roof water entering a septic tank can have a negative impact on the treatment process resulting in system failure. Cleaning is done in three stages. The raw wastewater is led into the pre-chamber. The wastewater is sedimented and buffered. Primary sludge will sink to the ground and will reduce its volume by digestion in the absence of air. On the outlet of the pre-chamber, the water is hydraulically restricted and backed up, if required. Independent of hydraulic peaks, the mechanically cleaned wastewater is distributed evenly over the entire day and forwarded to the bioreactor downstream. Learn more about the benefits of our small wastewater treatment plant and click the marked points on the graph. The clearfox nature disappears into the earth on the smallest area possible. And if wished, it can be directly transported right to the door. The bioreactor consists of a system with aeration elements and sedentary media which are arranged above each other in a certain order. On the surface of the bioreactor, there is a distribution device consisting of compensator and distribution soil. The restriction outlet from the pre-chamber fills the compensator which drains the water in flushes to both onto the distribution soil. The wastewater will enter the support medium system below and flow from the top to the bottom. On the sedentary medium, bacteria colonises to clean the water. Due to the so-called cascaded plug flow, the water will be entirely cleaned in only one go. At the same time, the secondary produced sludge is reduced in volume and biologically degraded. The remaining amount of solids is led out through the outlet and is far below any legal provisions. Due to this process technology – which is being used for the first time in a home sewage system – a further secondary sedimentation tank (such as in conventional biofilm plants) is not required. The system consisting of support medium is balanced with its filling device concerning catabolism, bio mass distribution and rinsing effect. This is the reason why the support medium does not need to be cleaned or replaced as in bio filter plants, but is effective absolutely without any changes for the lifetime of the plants, if they are operated properly. Current EPA and Environment Agency regulations often do not permit the installation of a septic tank. By installing a modern sewage treatment plant you can discharge the treated effluent directly into a drain or watercourse. This removes the need for an expensive soakaway. Modern packaged sewage treatment plants are plug and play units and are very simple to install. They operate on the principal of mixing air with the wastewater. Bacteria then develop naturally and grow in the system. They feed on the organic material in the sewage and the oxygen introduced via the aeration process. A high-performance aeration system with internal air distribution elements supplies oxygen to the bacteria. Each place in the biology tank is supplied unhindered. There are no dead zones. Due to the high air circulation, a real, completely biological degradation is guaranteed. The wastewater filter elements add a mechanical/physical cleaning effect to this process. Many old fashioned systems have air pumps running 24 hours a day mixing air with the wastewater as part of the treatment process. 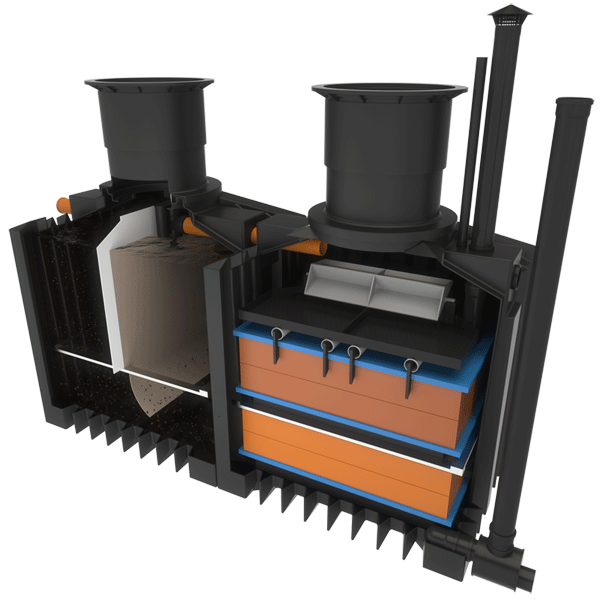 Clearfox low energy sewage treatment plants have the lowest running costs on the market. This had been independently verified by extended test periods. If you compare our EN12566-3 certification with any competitor plant you will see this. Our systems are British water approved and SR66 approved for use in Ireland. We also have a ground breaking system called the ClearFox Nature. This is the only non electric home sewage system on the market that uses no electricity and never requires any replacement parts. Other non electric systems still require replacement parts and maintenance. If you are building a new house or need a septic tank upgrade, then the Clearfox non electric domestic wastewater treatment plant, or the low energy sewage treatment systems we have represent the most robust, reliable and cost effective solution on the market. Our experts are available to speak to you and give you advice on how to upgrade your septic tank or how to install a domestic wastewater treatment plant as part of your new build project. 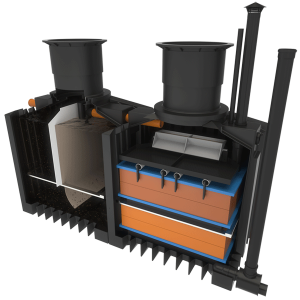 The aeration system is delivered as an complete unit. Complicated pipe installations are not required on site. No connection to the roof ventilation (which is often not suitable) is required. manhole pit extensions also available. ClearFox® nature is a small wastewater treatment plant manufactured by the PPU company in Germany. It doesn’t need any power supply and is best in eco-efficiency and sustainability. These facts have recently been published in a research report by the Deutsche Bundesstiftung Umwelt DBU. Nowadays small wastewater treatment plants are technically state of the art and offer a complete biological treatment of domestic wastewater. So far only technological and economical aspects could help to find the most suitable system. The results of the DBU report ” Analyse und Bewertung der Nachhaltigkeit und Ökoeffizienz von Kleinkläranlagen mit Ableitung von Produktverbesserungen” (1) can now be used to evaluate also sustainability and eco-efficiency. By 1990 the word “eco-efficiency” was mentioned first and the ecological impact was seriously discussed. Eco-efficiency means to diminish the consumption of resources and the environmental impact as well as to improve the economical benefit. The treatment efficiency is a basic requirement to be reached. All certificated German small wastewater treatment systems fulfill that task. The WBCSD (2) has also added to improve the benefit of the product itself and the service. Within the framework of the DBU research project, the life cycle of a product was followed, which also included the raw material production and the production of the plant. In addition, the operation as well as the disposal and the reuse of the materials were included. In the case of the procedure according to ISO 14045 (3), the investigation framework was initially established and the investigation system, in this case “small wastewater treatment plant”, was defined. Therefore, on the one hand environmental effects, including resource utilization, must be listed and, on the other hand, the product system benefit should be compared with a life cycle cost calculation. The consideration of environmental impacts includes the harm categories of human health, ecosystem quality, climate change / greenhouse potential and resources. On the basis of these extensive preliminary examinations various indicators for the assessment of the small wastewater treatment plants were worked out. This set of indicators represent the relevant benchmark for the pragmatic assessment of eco-efficiency. The container size has a significant effect on the eco-efficiency. Although larger tanks can have positive effects on the operation, negative environmental impacts and higher overall costs have a far more disadvantageous effect. The overall cost difference results mainly from the differences in the operational costs. The most cost-effective use is again biofilters, including ClearFox® nature and wetland systems. Over the entire life cycle, the small wastewater treatment system ClearFox® nature performs even better because no material has to be exchanged during the lifetime, as opposed to biofilters. This is due to the fact that ClearFox® nature does not contain any rotting and clogging materials. The material types as well as the effort for the extraction and scarcity of the raw materials also flow into the considerations. In this context, spare parts must be considered which reduce eco-efficiency, depending on the frequency of replacement and the material. Electrical components in particular must be evaluated negatively. Biofilters and the small treatment plant ClearFox® nature as well as wetland systems achieve higher efficiency values than other small treatment plants. However, the disposal of wetland systems has a negative effect. The figure below illustrates these results. ClearFox® nature is beneficial due to the lifetime use of the material in the bioreactor. The DBU- research report proves that ClearFox® nature is leading in eco-efficiency!